Use The Cask of Amontillado, Edgar Allan Poe’s creepy tale of twisted justice, to teach your students the elements of literary analysis. 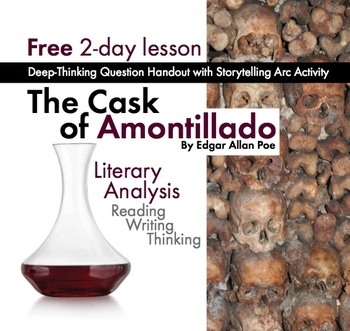 This two-day lesson plan includes a 15-question deep-thinking exercise (with detailed answer key/class discussion starters) and a Storytelling Arc handout (with completed key) to emphasize exposition, conflict, rising action, climax, falling action, and resolution. Finally, this PDF also includes a link to a short anticipatory video clip that will build students’ interest in the American Gothic tale. NOTE: This item is also included in my English 9-10 full-year curriculum. If you already own the full-year download, there's no need to download this item here individually. If you’d like to receive this item plus everything else needed to teach 180 days of English 9 or English 10 at a deeply discounted price, click here to learn more about the full-year curriculum download.